Hey friends, I have officially moved my blog over to Word Press. You can find me now at www.myfreshlybrewedlife.com. I can't take any credit for the move as I am technically challenged. Erin over at Insight Blog Designs was the genius behind my move. She was a joy to work with, very quick and efficient. I would definately recommend Erin if you are ever looking to make the switch. Plus, she has designed some beautiful blogs! I have the same beautiful design for now. But look for surprises with regard to that coming soon! For those of you who subscribe through Blogger's RSS feed, you will be redirected in a day or two. But please feel free to bookmark the new site so that you don't lose me. If you subscribe through email or GFC, you should have already landed at my new page! *I will keep this blog up, but will not be posting here anymore! It may take me a little while before I am completely comfortable in my new home. So if anything looks strange, it's just me playing around with the new dashboard. It's easy to find beauty in the obvious - a sunrise, a rainbow, a child's smile, the smell of freshly cut flowers. I am learning though that beauty is even more simple than the obvious. I continue to look, to seek out beauty, yet it's always there, right in front of my eyes. 51. My first born son, who turns 17 today. He has a heart after God and I am forever grateful that God chose me to be his momma! 52. Car insurance. Someone stole a very expensive part off of our car. We are thankful that our deductible is minimal. 53. Foot washing. We had a foot washing service in the Children's Equipping Center yesterday. All but four of the kids participated. It was touching and powerful to witness the children serving one another in this way. 54. Vacuums. I cannot imagine having to get on my hands and knees and pick up all the little fragments that the kiddos leave behind. 55. Eye makeup remover. Whoever created this stuff was a genius. 56. Toothpaste. What on earth did people use before this was invented? 57. Mexican food. Need I say more? I cooked a lot of Mexican food this week at my son's request for his birthday. I forgot that I was dieting. Oops! I will be back on track tomorrow. 58. Fuzzy socks. My feet are about the only part of me that get cold. Love the fuzzy slipper socks! 59. Candles. We had a power outage a few nights ago. Once we found the candles, it was nice. 60. Another borrowed car. I am so thankful for those who have loaned us their cars while we fix our other ones. What are you thankful for today? Link up at A Holy Experience. Glimpse: A momentary or partial view. The beauty of Christ, and all that He offers to us, is seen through our imperfect eyes. We simply will not always see it with our natural eyes. It takes spiritual eyes to see, knowledge and understanding. This week I have been asking God to open my eyes to truly see this beauty that surrounds me. My eyes see in part, incompletely. Yet I keep looking. It's been a busy week for me. But I have purposed in my heart to catch glimpses. Even while running in different directions, His beauty is still there. And when I catch those glimpses, they are planting seeds in my heart. And as I am faithful to cultivate that which I can already see, the beauty is soon revealed for what it truly is. 36. My Monday days off so that I can volunteer with Trade As One to help fight the cause of Human Trafficking. 37. The gift of multi-tasking. I have become quite good at it. 38. My Willow Store dryer balls that I won on Rachel's blog. Anything that cuts down my laundry time is a gift! 39. The smell of fresh air after the rain. 40. Glimpses of spring sprouting up in my front yard. 41. Negative Strep tests for both my son and I last week. 42. Glimpses of heaven. Thank you Corey Russell for giving me a greater glimpse into the throne room this weekend. 43. A warm cup of tea on a cold day. 44. A full nights sleep without children waking up. 45. The laughter of my children in between bites of breakfast, although we might be late for school. 46. A glimpse of the sun peeking through stormy clouds. God brings hope. 47. My crock pot. Makes cooking easy. 48. A glimpse of the dove that has made her nest in our front yard. Spring is coming. 49. My housekeeping husband. When I fall behind, he gets the job done. 50. My tender heart before the Lord today. May it never grow stale or cold. What are you thankful for today? Link up with us at A Holy Experience or leave me a comment letting me know. I was sitting at a Starbucks last week, waiting for my son to take a test. I was looking forward to catching up on my favorite blogs in my Google Reader, and chatting with a friend through Facebook Chat. A young girl, probably in her early 20s, came and sat at the table next to me, then left to get her coffee. I noticed a nice leather journal and a Bible on the table where she was sitting. I got excited. Maybe I would introduce myself to her and we would have a cool conversation about God. I started to rehearse in my head what I would say to "break the ice". But that was short lived. She was waiting for someone and he came and sat down with her and they chatted. Because my table was in such close proximity to hers, I couldn't help but overhear most of their conversation, even though I was trying really hard to concentrate on my blog reading. They talked about a conference she attended, and he talked about his job. They talked of church and home groups. Intermixed with all of this was talk of partying, drinking, a swear word here and there, relationships gone bad. I was confused. Wasn't she a Christian? Didn't I just see her bring in her Bible? She was living a life of compromise. I do not believe that God brought her there that morning for me to judge her. However, the Holy Spirit began to speak to my heart about the little compromises that I make in my life and how they keep me from growing and from producing good fruit. When I read this verse, I think of those small little things that creep into my life with God and stunt my growth. Bad attitudes. Poor decisions. Selfish indulgences. Momentary pleasures. Speech that tears down. Lost tempers. Impatience. Laziness. Complacency. These are just a few of the little foxes that come to attack the vineyard of my heart. A garden cannot grow as long as these things are attached to the vine. It is up to me to tend the garden of my heart. I cannot allow things to enter in that come to kill, steal and destroy what is being cultivated there. Do I represent Christ well in my life? Do I walk the walk, not just talk the talk? Do others see me as a friend of God? Would someone question why I brought a Bible into the room? Is my speech uplifting others and glorying God? My heart was moved and grieved. I am not living a deep, dark secret life that no one knows about. Those closest to me would tell you I am pretty much an open book. But it is the awareness my life of compromise that has caused me to stop and taken inventory of my heart. When I accepted Jesus into my life, I became a new creation. I am to walk in newness of life. No longer acting upon the sinful desires of my flesh. I am to be dead to sin. It is by God's grace that I have the strength to continue walking in freedom, in newness of life, not allowing the little compromises in. But it's a choice. Does what I watch on TV glorify the Lord? Do I discipline my children in a Godly manner? Do I treat my husband with honor and respect? Do I love others well? Do I allow fear, worry and regret to steal my peace? .....and the list goes on. I was made in the image of Christ. And the more time I spend with Him, the more I will look like Him. I do not want to be a Christian who goes to church and does all of the right things, but who's life is questioned. I want my life to count for Christ. I want to produce good fruit. I don't just want to simply exist. I don't want to be religious. I desire to be like Christ. I want to live a life of no compromise. 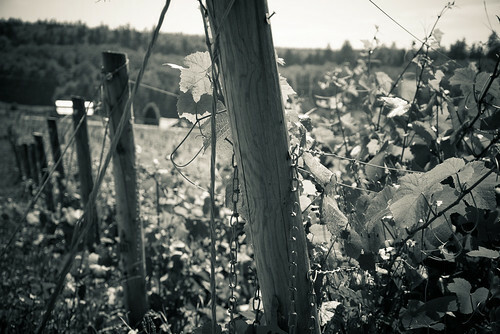 I thank God for opening my eyes and my heart that morning to the things that come to spoil my vineyard. I thank Him for keeping my heart in a tender place, where I can hear His voice and respond to His heart. Most of all, I thank Him for His amazing grace to forgive my misguided steps and decisions and set me on the path to fullness in His presence. I am a wife, mom to 4 beautiful children, sister, daughter and friend. I am a child of the King of Kings and have been marked by love by a relentless God who loves me unconditionally. I love coffee and chocolate and popcorn! My desire is to encourage woman in all walks of life in their walk with the Lord. Thoughts of Spring Blog Party!